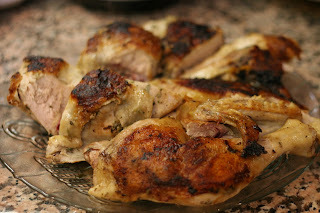 I love few things more than a well roasted chicken. For some reason, I never tire of it and love the whole process of prepping, cooking, serving and eating it, then picking the meat off the bones (and making sure I get the oysters!!) and using it for another meal while using the bones to make stock. 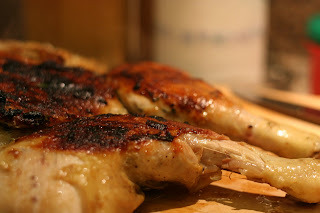 I guess saying that chicken is one of my favorite foods sounds awfully generic, but if you've ever had a well prepared bird, you'll likely agree with me. It's one of the simple pleasures in life. 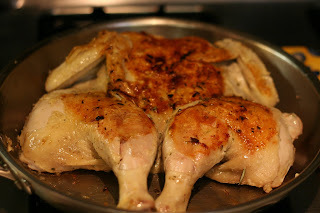 I roast a chicken probably two or three times a month, but I'd never tried the brick method- butterflying a whole chicken and then cooking it on a grill or in a pan with another pan on top of the bird, weighed down by bricks. It's something I've always thought about trying, and after seeing it done twice in one week on the Food Network, I figured it was time to give it a go. It was easy enough to cut the neck bone out with a pair of kitchen shears, then flatten the whole thing by pressing down on the back of the breast with some muscle. I slathered it in a paste made from garlic, olive oil, salt, pepper and lots of rosemary and put it in the fridge to chill out for a day. After bringing birdie to room temp by letting it sit on the counter for an hour, I preheated a large pan, drizzled in a bit of olive oil and set the chicken in skin side down. 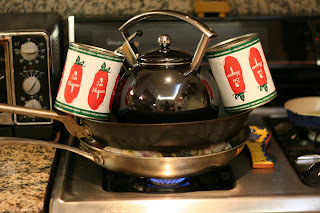 Ok, here's where I improvised on the brick method- I didn't have any bricks so I filled up my kettle with water and got 2 large cans of tomatoes out to weigh down the pan I set on top of the chicken. It seemed to work well enough, and I could hear the chicken skin sizzling loudly. Oh and the smell! The aroma of chicken skin cracking mixed with garlic and rosemary.....seriously, shouldn't someone make an air freshner that smells like that? After about 15 minutes I flipped the chicken over and let it finish cooking, then let it rest before chopping it into large pieces. J and I sat down, got our napkins ready and attacked! The skin was super crispy and the meat was tender. It was seriously delicious. So what can be done with the leftovers? Well, J and I have this thing called "drunk cooking." OK, maybe I am not literally drunk when I do this but it's what happens when we have a few glasses of wine, then J says, "I'm hungry!" I don't know why but I take it as a challenge and try to make something really good out of what's in the fridge. ....as she sits perched on the arm of our sofa as she is every night! So the other night when we found ourselves in this situation, I was lucky enough to have some leftover chicken. I also had one whole wheat tortilla and a nugget of good parmesan cheese. 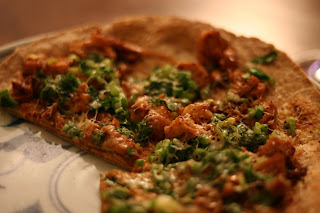 I tossed the chopped chicken in some spicy BBQ sauce and made a tortilla pizza topped with grated parmesan, chopped cilantro and diced green onions. Man, it was so good. 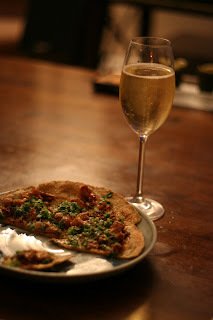 Of course a glass of champagne makes anything taste better but it really was something that I think I'll make again while not drunk cooking, ha. Shouldn't the Food Network create a show called Drunk Cooking?? I think it'd be a hit, especially with guys, ha. Anyway, I think I prefer a roast chicken to this brick method, just because it's less messy (the rendered fat from the skin splatters all over the stovetop) and it's always nice to have something roasting in the oven. However, this brick method is great if you want a crispy skin and are short on time - since it lies flat it cooks much faster than roasting a whole chicken. Once summer rolls around, I will also see if it works better on the grill. In the meantime, give it a try! 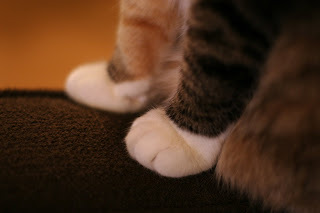 I love that picture of kitty feet! 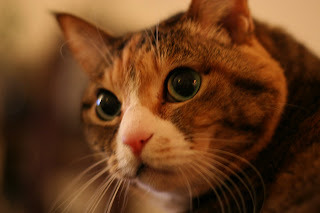 Nice job with the new camera. 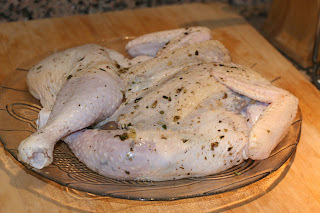 For some reason, whenever I see a chicken spread out like that, it makes me chuckle! Or more accurately, laugh, since I'm not a 60-year-old man. Your idea for the show "drunk cooking" is EXCELLENT! I totally understand what you mean by that, being not too far removed from college...and we do it all the time in my house too. Thanks!